Thai food Culture is one of the most internationally spread cuisines, and is often considered a favorite. 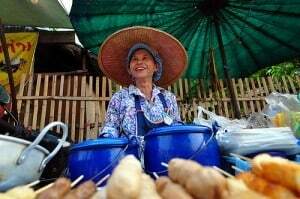 Having spent some time in Thailand, I’ve noticed that they have a very strong food culture, which I feel is very special and unique to Thailand. I noticed many things myself, but it wasn’t until I had that private cooking course in Chiang Mai that I got a true understanding of the Thai peoples food culture, and started to appreciate the little details they pay much attention to. In fact, I rarely saw a Thai person eating alone. Usually they eat in groups, either with family or friends. The Thai people are a very social people in general, and eating is something they like to do together. Even at the restaurants and shops, all the staff sat down together at lunch time, with a big meal for everyone to share. There is no specific meal for Breakfast, Lunch or Dinner. They eat whatever meal they want. They can eat fried rice for breakfast, noodles for lunch and soup for dinner, or the opposite way around. They never eat cornflakes and yoghurt as a meal. My cooking teacher GayRay told me that they see western meals such as cornflakes, toast and even pizza as just a snack. What I love about the Thailand food culture is that they always balance their meals with the five fundamental taste senses. In the West, we usually choose one or two per meal, either salty and spicy, or just sweet. In Thai food they combine all five senses; salty, spicy, sour, sweet and bitter – into one and the same meal. This makes the food so interesting for your taste buds! No matter whether it’s a street food restaurant or a hotel, your meal will always be served with pretty decorations. This could be flowers, nicely cut cucumbers or fruit. Unless you’re eating a western style steak, you will be served with a fork and spoon. Thai people eat with their spoon in the right hand, and the fork in the left. They often have chop stick available, which is something influenced from China, but most Thai people can’t actually eat with chop sticks. This is what they told me, and I haven’t seen any Thai people using chop sticks yet. Thai people love to snack, and often do so when they’re on their way somewhere. Sweets and desserts are usually not eaten on meal times, but as snack. When you’re invited to a Thai person’s house you’re always greeted with a welcome snack, which for the record was the best snack I’ve ever had. They put a plate on the table with roasted peanuts, coconut (sweet), ginger (bitter), lime (sour), shallots, and chili (spicy), which you fold into a betel leaf, drizzle some palm sugar and eat together with your host (shove it all in at once). It’s a feast as well as a shock for your taste buds, but I couldn’t get enough of it! Thai people always finish the food on the plate. They believe that wasting rice brings bad luck. When I think about it, all the healthy rules I’ve learned about food, what you should eat and how you should eat, the Thai people follow. I love eating in Thailand because every hour of the day is a time for food. In eating tiny portions and essentially snacking throughout, you end up consuming less in the long run and being healthier for it! One quick correction with the chopsticks: they are used, but for soup. Thai cuisine is fun because there are different etiquettes for different foods: Isaan foods are often eaten with your hands (sticky rice in the right hand, scooping up the food), rice and noodle dishes with the spoon and fork, and soups with chopsticks and a spoon. The chopsticks present at a restaurant inevitably means that it has soup on the menu. Fun roundup and I’m so glad you enjoyed the food here! What was your favourite dish? This is really interesting. I always wondered about the meal they ate for ‘breakfast’, I didn’t realise that they don’t have a particular meal at a particular time. I love having noodles and rice for breakfast because it fills me for the day. It doesn’t feel adequate now I’m home and have cereal for breaky, I’m starving again by 10am! I once had a Thai tour guide who wasn’t keen on Western food. We once encouraged him to try a lamb shank which he loved but covered with fresh chillies. A surprisingly good combination! I love, love, love the food in Thailand! It’s interesting to hear more about the culture of eating there…thank you! Cheers! Thai people also love talking about their next meal. I would be eating breakfast with my Thai friends and they would be talking about what to eat for lunch and dinner. Loved it and have never talked so much about food in my life. I dated (and was briefly married to) a Thai guy for five years and this brought back a lot of good memories of sitting around a table and enjoying snacks. I enjoy any culture that enjoys food and the wonderfully happy people of Thailand enjoy it so much! Great blog post — can’t wait to travel in Thailand and discover the fab foods and lifestyle. Combining all five senses into the same meal sounds interesting. I have a gluten intolerance so the Thai diet sounds like something that would very much agree with me. Do you know if the noodles are wheat or rice based? Thai food is still so new to me. The fact they cover all tastes is fascinating though and I cannot wait to try the real thing. Thanks for the correction Jodi, and you’re so right that every hour is a time for food! My favorite dish was, without a doubt, Khao Soi – yum! Having a real meal for breakfast makes such a difference, I agree, cereal just doesn’t fill you up the same way. That’s a great example which shows how important food is to Thai people in their daily life. You’ll love it, there is food around every corner, and the life style is so different from the west. The cooking class was definitely a highlight of our trip through Thailand, strongly recommend it! Yeah it’s hard to imagine, and mixing them all together is a bit of a shock to the taste buds, but so much more interesting! They use many kinds of noodles, but rice noodles are among the most common ones. You can usually ask them to use the type of noodles that you want. Thanks for sharing your story, I agree, I love the culture of Thailand and the importance they place on food. I didn’t used to like Thai food, but once I actually got to Thailand and tried the ‘real deal’ my opinion about it has changed. Yum! Ever since my trip to Southeast Asia a few years back I have eaten Thai food at least once every week or two…and last night my wife and I ventured to our fav Thai spot ( and the BEST Thai place in Seattle ), so this post was the perfect post Panang curry read! I lived in Thailand for 7 years and it was fun to read your blog. I remember when I first arrived, I could not believe I could smell bbq at 6am! It took some time to get used to the fork and spoon method but it actually feels better than a knife. One thing I could never get used to was the “no spicy” concept that Thais can not grasp. Whenever I would ask for no spicy or no chili, sure enough there would at least be five floating around. My Thai wife eats a minimum 6 times a day albeit good healthy food. I just don’t know where she puts it. Just a question but how many meals would a Thai person aproximatly have in per day? Any good Thai spots in North County San Diego?